Sumo wrestling is uniquely Japanese, and we were keen to see this fascinating, centuries old sport first hand. Unfortunately, there were no wrestling matches taking place in Tokyo whilst we were visiting (you can click here for the Grand Tournament schedule). Undeterred by this information, I started to research how we could watch the morning sumo wrestling practice, known as Keiko at a Sumo-Beya instead. 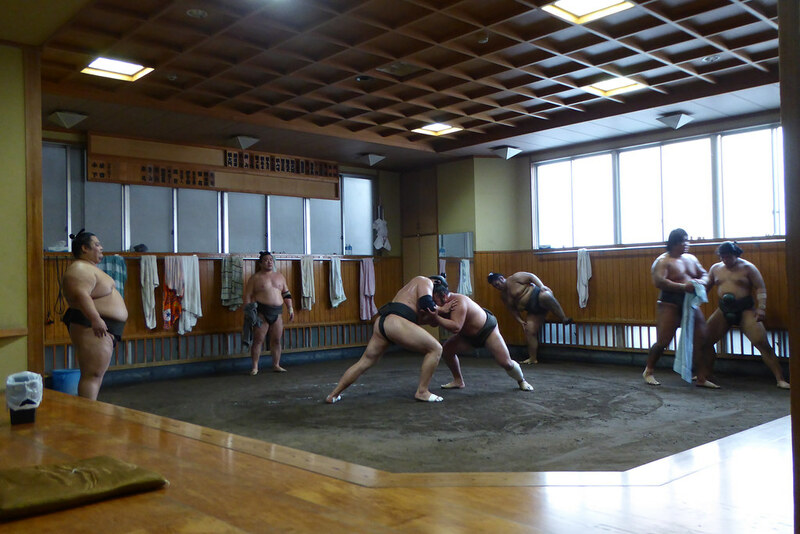 A sumo beya or stable is an organisation of sumo wrestlers and it is also the place where they train and live. All professional wrestlers must belong to one and there is no transfer system, wrestlers will nearly always stay in the same beya until the end of their career. They vary in size from as few as two wrestlers to around thirty and most are located in the Ryōgoku district of Tokyo. Currently there are 43 active beyas. 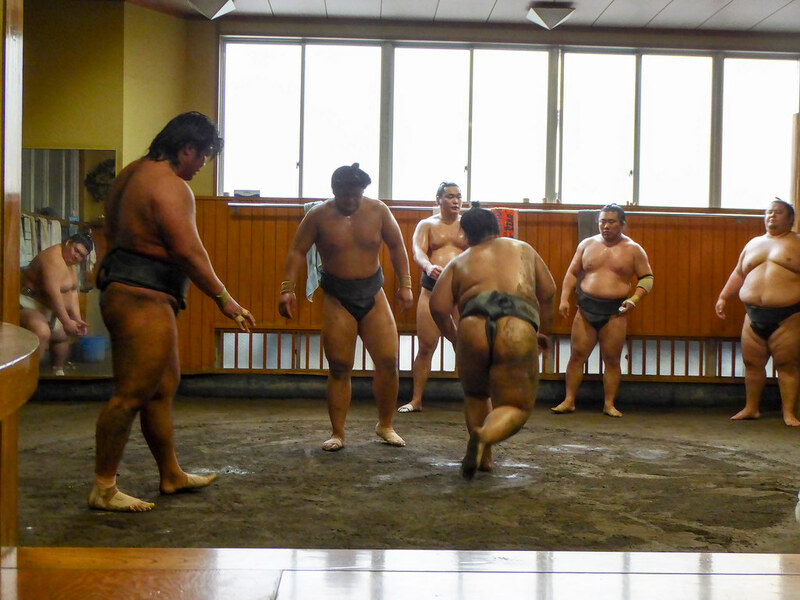 It was a little tricky as most of the websites are in Japanese, therefore I have created a short guide from our experience to make things easier for anyone else interested in observing this sport up close and personal at a Sumo-Beya. Many websites state that you must be accompanied by a Japanese person to visit and therefore should book their very expensive guided tour (often more than £100 per person). However, this is not true, you just need to observe the rules of the training facility and be respectful. As tempting as it is to have someone else to figure it out for you, it is completely unnecessary and very easy to do it yourself for free. 1. Locate the beya you want to visit. One of the biggest is Arashio beya they have a website with an English page which is useful – to visit it click here. However, they have become popular with tourists and only have a small space for spectators so you cannot enter and have to watch from the street through the window – not the best experience in my opinion. We went to the Takasago-beya(高砂部屋), the phone number is: 03-5608-3223. For a full list of the sumo beyas click here, and then you might need to do some google research to find a phone number. 2. Before visiting the beya it is important to call the day before. The sumo wrestlers don’t practice every day and sometimes they are out of town so it is good to check that Keiko is taking place. It is also polite to inform them that you will be attending the following morning. Below is a Japanese script I have copied from the Arashio beya website that will help you discuss the keiko schedule over the telephone. 3. Turn up and enjoy! The opening times for Keiko vary from beya to beya usually somewhere between 5.30 – 8.30am and lasts roughly three hours. On entering you will be given a cushion to sit on at the back of the room. Try to avoid sitting with the soles of your feet pointing towards the wrestlers. At the end of the practice the wrestlers are sometimes happy to pose for photos and chat in Japanese to visitors although this is not obligatory and shouldn’t be expected. A sumo-beya is not a tourist attraction so please don’t treat it as one. The wrestlers are professionals and take training very seriously. Imagine being allowed to turn up at Chelsea FC training session! • No taking photos with a flash or a noisy shutters. Definitely no selfie sticks and in general try to take minimal photos as it can be distracting for the wrestlers. There is strict behaviour etiquette when observing Keiko. Please do not give foreigners a bad name, as we will end up getting banned which would be a real shame. Visiting the Takasago-beya was one of my favourite experiences in Japan, it was like nothing else I have observed before, and it allowed us an insight into the nuances and rituals of this Japanese style of wrestling. Thank you for writing such an informative post! I’m hoping to visit this Beya next week but doesn’t speak a word of Japanese, so not sure how to find out the time. May I know what time you got there to watch the training? Super Jealous! I wish we could be there now. We didn’t go super early. I think 8 am or so, best of luck! I love your post- thank you so much for the information. I cant seem to find if watching the wrestlers was free inside Takasago-beya Sumo Stables, do remember if you paid a fee to come inside and watch?